Northern Cross Country Championships, Sat 30th Jan: Witton park Blackburn. With the harriers having 7 complete teams, and five of those in the top 10 teams with two teams getting medals, this was another great success for the club. We again had an excellent number of athletes entered - with 61 of the 3170 total entries for the event, from the club. Given the amount of rain that had fallen over the last few weeks it was always going to be wet underfoot, but the sodden ground, mixed with the very high winds and occasional snow / hail flurries made for very demanding conditions for all involved. The Northern Championships always attract high numbers of runners and also many of the top runners in the North, and this year was no exception. The first race was the U17 women's race, and Grace Morton was again the only club athlete in this category, finishing 84th out of 99. Alice Moore, for Barnsley AC, finished second. Next off was the U15 boys race, and the club had 6 athletes in this race. Matthew Stevens had an excellent run to finish 27th (and the first SY athlete home) and lead the scoring team ofJack Stokes (63rd) Bailey Stead (67th) and Oliver Bowater (81st) home in a very creditable 6th place, which made them the 2nd Yorkshire team. Sam Picton (106th and Howard Kniveton (144th) both provided support & backup. Bethany Mount (106th) and Emma Ball (156th) provided support in difficult conditions as the hail and snow fell. 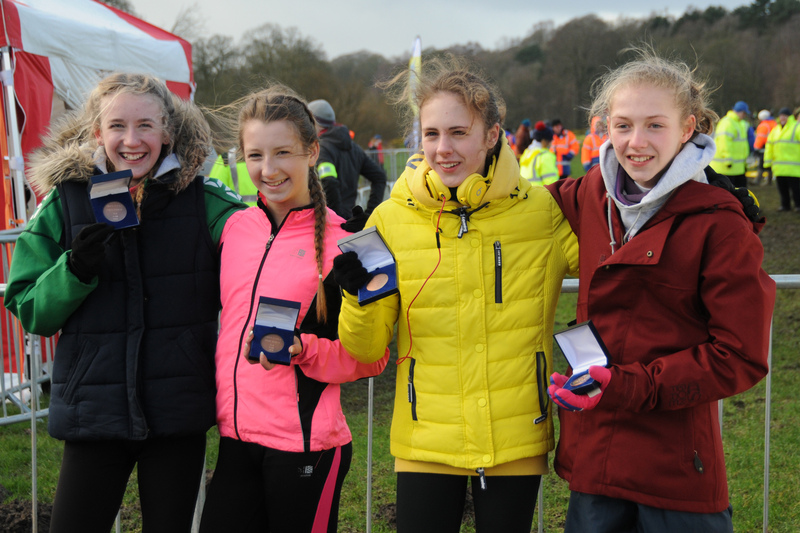 The U13 girls was the next race involving our club, and we had 4 athletes starting, unfortunately Ruby Hewitt, who was the first athlete home in the Yorkshire Champs, had been suffering with illness prior to this race and had to drop out early in the race. Leah Hayward had an absolutely storming run to finish 30th, 10 places higher that her Yorkshire result but against much stronger competition.Abby Stroughair was 137th and Keira Sampson was 157th. The u17 men's race saw the club with a full team of 4 athletes, albeit without Kane Smith (who is still struggling to overcome a groin injury).Joe Massingham had a better run than his county performance to finish 6th, Declan Walker-Smith (57th) Matthew Walker (67th) and Aaron Wickson (97th0 were rewarded with a fine 6th team place. The u13 boys race had 7 athletes from the club, Jay Jessop led the team home in 100th place, new member Joshua Wragg (in his first race for the club) finished a creditable 113th, Thomas Brailsford, who only turned 11 in early January ran well in his first big championship event, to finish 136th, Jack Steele completed the scoring team of 4, in143rd place to place the team 19th, out of 25. The U20 men's race started at 1:40pm with 3 club athletes competing. Luke Cotter and Ryan Beale were in the lead group on the first of 3 laps, along with eventual winner Patrick Dever (Preston AC) and second place finisher Jonathan Shields (City of Sheffield & Dearne AC). Luke & Ryan battled for the whole race with Ryan having one of the runs of his career to date to finish 6th, with Luke in 7th place. Devon Stead was 38th, and if we had a 4th runner inside the first 50 we would have won the gold team medal. With the ground conditions getting somewhat muddier, the senior women started their 7.7Km race at 2:10 pm. Of the 9 club athletes entered, only 6 were on the start line due to illness / injury, and we were without Yorkshire team medal winner Fiona Davies. However the athletes all got good starts, and on the second of the 3 laps it was evident that the team race would be fairly close, Hallamshire, Vale Royal and Rotherham were all in contention, and Leeds City had 2 athletes in the leading group. At the finish it was clear that Hallamshire were the likely team winners, but still close for the other medals. The final team scores were Hallamshire 70 points, Vale Royal 101 points and Rotherham 111 points. Liverpool were 4th 26 points behind us. It is a measure of the squad strength, built up by team manager Nigel Brookes, that they are now consistently winning medals when not all the squad are able to compete. Samantha Johnson again had an excellent run to finish 16th, Jess Fawcett (25th) Emma Parkinson (another improving run to finish 31st) and Alina Stepanchuk (39th and winning her first team medal) were supported by Sasha Gallagher (180th) and Gill Taylor (261st). were all International athletes shows the high standard of this race. The final race of the day - the senior mens championship was off at 3:00pm and team manager Pete Shaw had done a great job in getting 13 athletes on the start line. All 13 finished, which meant that for the first time for many years we had 2 complete 6 man teams to finish in this event. The first 6 athletes home, to secure an excellent 9th place, were: Elliot Smales (a great run to finish 43rd) Kyle Craib (54th) Aidan Johnson (56th) Richard Harris (102) Sam Clegg (143) Gareth Sampson (149). Further positions were Phil Hoole 186, Damian Kitson 215, Ian Whyman 327, Howard Darwin 378, Steve Marshall 439, James Gallacher 487, Jonathan Maxfield 591. A total of 720 athletes finished the very demanding course, with two big hills on each of the 4 laps, and ankle deep mud on most of the lap. Charlie Hulson (Sale Harriers) the National 2015 champion was the race winner, and Salford AC won the team event. Thanks to all the parents, spectators and club supporters for cheering the athletes on.